A few years ago, Paul and Judy Pogue went on a hunt, a hunt for a place off the grid. They were in search of a place where they could disconnect from the hustle and grind of life to reconnect the family in fellowship with God, experience some tech-free adventures, and hunt. Tucked within the breathtaking Ouachita Mountains of Southeastern Oklahoma, they discovered the ranch, more than 2,000 acres of scenic views, pine trees scattered across rocky terrain, flowing streams, bustling wildlife, and the tranquility of being off the grid. As they spent more time at the ranch, they had more stories to share with friends and family. These stories often turned into invitations for friends from church and business to come experience the unique tranquility, peace and adventure they were experiencing. As more people came, and God moved in Paul, it became clear that the ranch was made for sharing. And it needed to be more than a casual thing. After prayer and doing some research, Paul and Judy made the commitment. They committed to make Pogue Ranch the preferred destination ranch in the region. Your prayers and your alms have come up as a memorial offering before God. 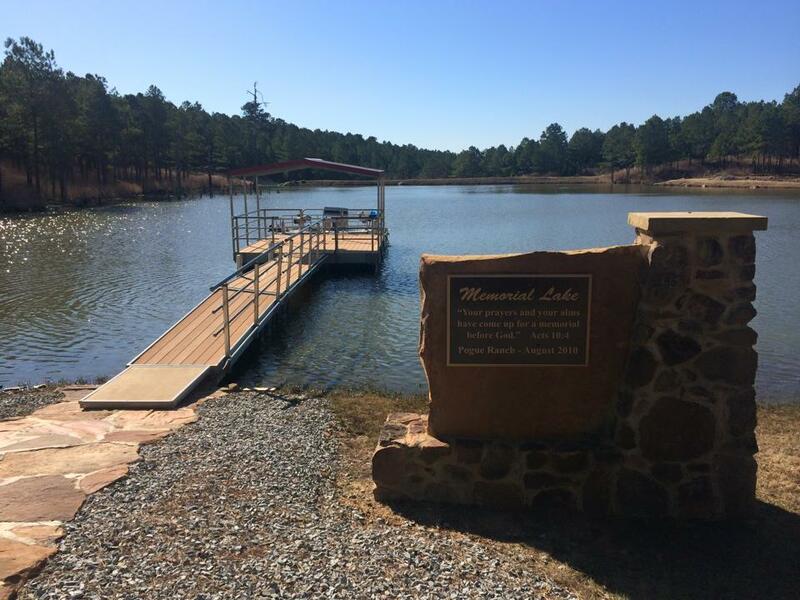 Memorial Lake is the crowning jewel of Pogue Ranch. It sits in the middle of the ranch with cabins nestled around it. It was built as a memorial to loved ones that had passed away. A place to sit, be still, listen, remember and be at peace. The lake was dug. Judy and Paul sat back to wait the year or more for it to fill up with rain water. The lake was full in 30 days! At that point, the Pogues knew that the ranch wasn’t for them to keep to themselves. It was for sharing. When you stay at Pogue Ranch, you are welcomed as part of the family. It is this mentality that drives every experience you have at Pogue Ranch. Come, listen, remember, and be at peace. If you ask past guests, Joe and Allie Fairchild are actually the crowning jewels of Pogue Ranch. Your ranch experience will be all you hope it to be in large part because of these experienced destination ranchers. The Fairchilds have seventy years of combined ranch management experience. Before coming to Pogue Ranch, Joe & Allie managed a 7,000-acre cattle ranch in Louisiana. They also managed the Historic UXU Ranch in Cody, WY, a 5-star dude and guest ranch just outside of Yellowstone. They’ve entertained guests from all over the world, showing them the best the land has to offer from trail rides to guided hikes. They sweat the small stuff, so you don’t have to. Joe is an expert cattle rancher, horse trainer, and Cowboy Preacher. Allie has an MBA with a focus on hospitality and human resource management.